New Hubble images have provided a dramatic glimpse of a large massive galaxy under assembly as smaller galaxies merge. This has commonly been thought to be the way galaxies grew in the young Universe, but now Hubble observations of the radio galaxy MRC 1138-262, nicknamed the "Spiderweb Galaxy," have shown dozens of star-forming satellite galaxies in the actual process of merging. In nature spiders earn our respect by constructing fascinating, well- organised webs in all shapes and sizes. But the beauty masks a cruel, fatal trap. 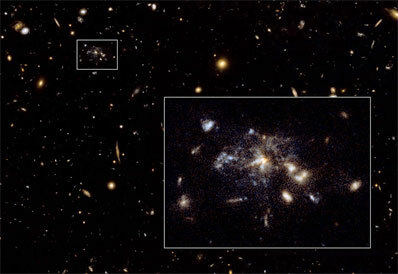 Analogously, the NASA/ESA Hubble Space Telescope has found a large galaxy 10.6 billion light-years away from Earth (at a redshift of 2.2) that is stuffing itself with smaller galaxies caught like flies in a web of gravity. The galaxy is so far away that astronomers are seeing it as it looked in the early formative years of the Universe, only 2 billion years after the Big Bang. The Hubble image shows the Spiderweb Galaxy sitting at the centre of an emergent galaxy cluster, surrounded by hundreds of other galaxies from the cluster. Team leader George Miley from Leiden Observatory in the Netherlands explains: "The new Hubble image is the best demonstration so far that large massive galaxies are built up by merging smaller ones." The image reaches much deeper than previous ones and shows the merging process in unprecedented detail. Galaxies can be seen as they are sucked into the Spiderweb at speeds of several hundred kilometres per second, from distances of more than a hundred thousand light-years around it. Radio telescopes have shown that jets of fast particles are being spewed out from the centre of the Spiderweb Galaxy with enormous energies. These jets are believed to be produced by a massive black hole buried deep in the nucleus of the system. The infalling galaxy "flies" are a source of food for this black hole "spider", allowing it to continue disgorging the jets. The new Hubble image provides a unique real-world example for testing theoretical models of massive galaxy formation. The complexity and clumpiness of the Spiderweb agrees qualitatively with the predictions of such models, but a surprising feature of the Spiderweb Galaxy is the presence of several faint small linear galaxies within the merging structure. The Spiderweb Galaxy is located in the southern constellation of Hydra (the water snake) and is one of the most massive galaxies known. This result was published 10th October 2006 in Astrophysical Journal Letters.